I am away for the next couple of days, so I thought I would leave you all with a bit of a tease!! 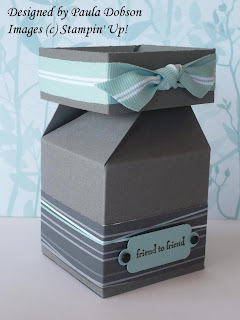 This litlle box is and "All in One" box, or Impossible Box, as I like to call it. I saw something similar on a random blog (Sorry, don't know whos) a while ago. Unfortunately, there were no instructions. I sat down determined to work it out, and I am pleased with the end result. As you can see, you simply lift the lid to open this little cutie. 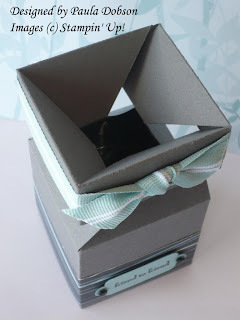 Here is the top when open: Just fill with your little sweets or chocolates! To close the "lid" simply push down and "voila! ", job done! 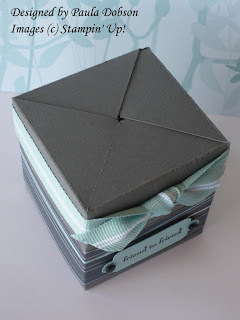 I had a very creative day on Tuesday and managed to turn out a couple of cards and a pretty impressive box! Check back over the next couple of days and you will see what I have been up to! I really love this wee card and the photo just doesn't do it justice! One of my favourite colours is purple (or any shade of!). I have used quite a smooth sponging technique here, although I added a bit of "atmosphere" in the sky by dabbing rather than smoothing. I am pleased with the overall effect. Please feel free to leave me a comment! For those of you who don't know, my nickname is Polly. I have been commissioned to do a piece of Artwork for a Kiwi friend who now lives in Australia. 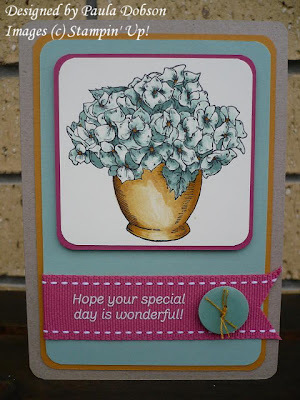 Before I attempt something bigger, I thought I had better practice on a card! Can you tell me where in New Zealand this landmark is? I have taken inspiration from Malcolm Warr, a New Zealand artist who used to live in Waikanae. He is known for his screen prints, but sadly no longer makes them. He now lives in Australia too (why is everyone leaving?!) and concentrates on etchings. If you would like to learn how to do this sponging technique, then why not come to my classes? I am holding an intermediate class on the 13th of March. 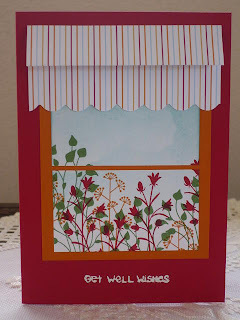 One of the projects we will be making is very similar to this card. Email me to register your seat!! As I have mentioned before, I have had the very good fortune to meet some wonderful people since joining the Stampin' Up! Family. One of these people is my very good friend, Debbie Ryan. I first met Debbie because of our shared love of crafting. Debbie has since attended a lot of my classes. 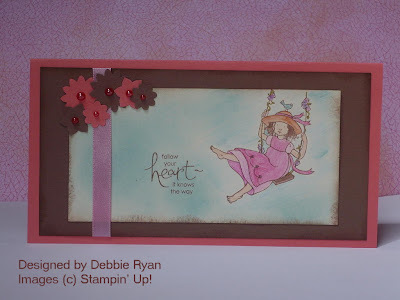 While I am a keen card maker, Debbie makes the most gorgeous Scrap Book pages. She has however, turned her hand to cardmaking as well. 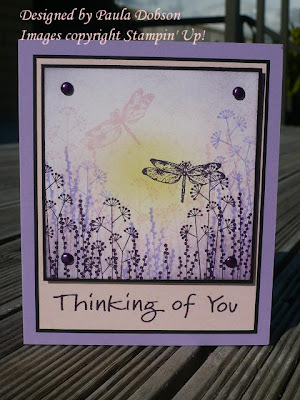 I caught up with Debbie yesterday and she showed me these two gorgeous cards she has made. With her permission I am able to share her divine cards with you as well! Debbie has also expressed her interest in joining my team. I am so excited to have her!! 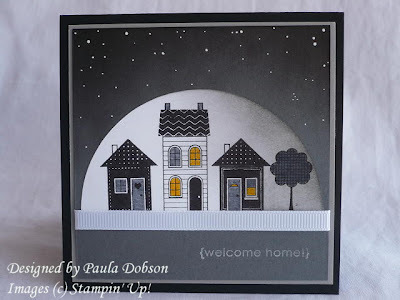 If you would like to make Stampin' Up! a part of your life, there is always room for one more on my team!! Email me if you would like to know more. Both of these beautiful cards feature two of the current SAB stamp sets that are FREE with any purchase of $120.00 or more. 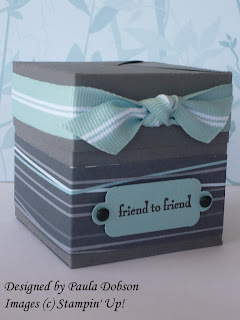 What better way to add to your stamp stash, than with FREE product. SAB runs until the end of March. Don't miss out. Email me your workshop date or order today!! Please let Debbie know what you think of her creations by leaving a comment. I feel very privileged to be able to share her work with you all. I had a definite plan in my head when I came up with this design. 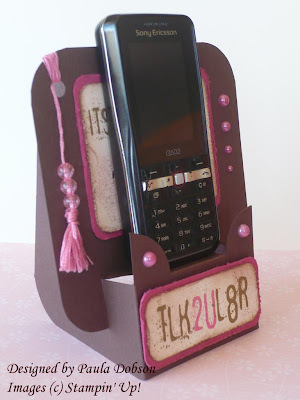 I want to use "text talk" and I also wanted the "hangy offy" bits that the kids like on their cell phones these days! I had to make the "hangy offy" bit myself because I don't have one myself! I used DMC silk and some large clear pink beads. I made a tassel, then threaded the beads into that before attaching to the card. I went digital for the wording and used my computer. I printed off they sayings on Vary Vanilla card stock, then grunged things up a bit. Using my Cutter Kit, I then destressed the edges of my card stock before adhering to the base card. I then added half pearls for a bit of "Bling". I am really pleased with how this turned out. I would love to hear what you think, so please leave a comment when you are done visiting!! I am so thankful for many things in my life today. I have a loving husband and daughter, who support me in all that I do. I am thankful for my loving extend family who always stand by me and encourage me also. I am thankful for my health, my jobs, and my friends. I am also extremely thankful to represent Stampin' Up! I get to meet so many wonderful people who share the same creative passion as I do. I belong to a wonderful team of Artists, who are not only talented, but share, encourage and support. If you want what I have then JOIN MY TEAM. I am looking to build my business and help others to do the same. I would love to have you join me on this exciting journey! Email me for more information on becoming a SU Demonstrator. You may want to start your own little business, or you may just prefer to take advantage of the Stampin' Up! discount we Demos enjoy. What ever you goal - I can help you achieve it! You know you want to!! Email me today! I thought I would try out a couple of different techniques as well, as if the colours weren't challenge enough, lol!! I stamped the image with Black Staz On. I coloured direct from the ink pad using a blender pen to create depth in the picture. I used SU Rubs ons from the Chit Chat set on the ribbon. These rub ons are fantastic. You can use them on just about any surface. Look how well they transferred on to the ribbon! I created my own button from sage shadow using the technique Danielle Dawes showed us all how to do. Check out her tutorial HERE. Thanks for stopping by! I remember last year trying so hard to find a nice Lighthouse stamp. That was in the days before I had heard of Stampin' Up! They have such a huge range of stamps in the current catalogue. I was lucky enough to stumble across a retired set called "Coast to Coast". As soon as I saw it I just knew I had to have it. This is just one of the four lighthouse stamps in the set. I had a lot of fun with this card. I had also sourced some metal embellishments that I just knew would make it. The netting is from a florist bouquet I received a while back. Before I throw anything out - I always look at ways I may be able to use it in my projects! I am guilty of having boxes of what some may consider "junk"!! It is amazing what you can use with a little imagination. Leave a comment and tell me what you think of this wee card. Thanks for stopping by, I appreciate all of my visitors!! 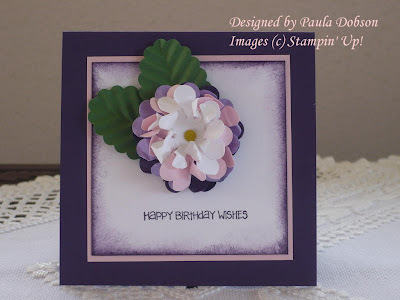 If you attended my sponging class in February, then you will recognise this card! 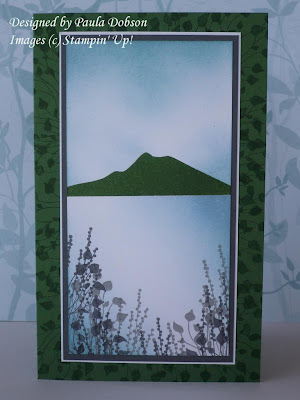 My lovely ladies learnt how to highlight with sponging on the flower card in my previous post, and then they learnt how to create a "sky" background with this card, turning it into a view from a window. It is hard to see in this picture, but there are a few clouds passing by too! 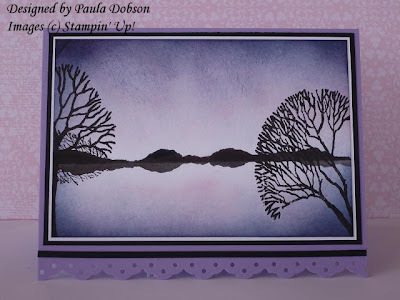 My next sponging class in March, will see them creating more complex images using this fabulous technique. If you would like to attend this class, then send me an email via the link on the right panel of my blog. Can't make the date, but would like to have the class come to you instead? I can do that too! All enquires are most welcome. Take advantage of the Sale-a-bration period and book a class or workshop with me during February and March. 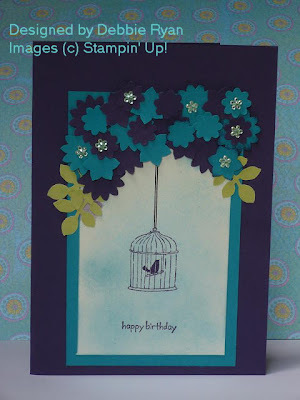 For every $120.00 in orders, you will qualify for a FREE Sale-a-bration stamp set!! These flowers are so gorgeous and whip up in no time at all. I must say though - it goes against my nature to screw up perfectly good cardstock!! But aren't they worth it? I have since gone on to make other, experimenting with colours at the same time. Check back often, I intend posting these pretty creations once I have completed them!! 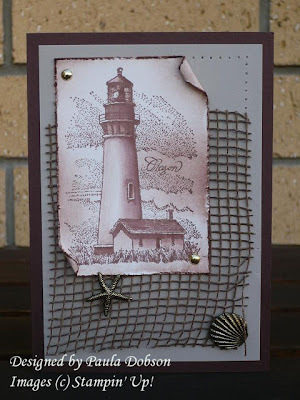 I cant think of a better way to showcase one of the fabulous FREE stamp sets you can get during the Sale-a-bration promotion than by making it into my challenge entry for this weeks Just Add Ink challenge (JAI3). A very quick post this morning. 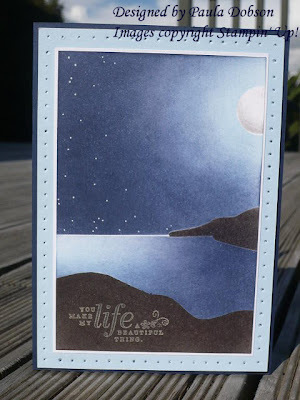 Pocket Silhouettes is one of my favourite stamp sets and at $39.95 for a set of 6 stamps, is also great value. I especially like to use it to build scenes. This is a soft and subtle way of letting someone special know that you are thinking of them. I really like the soft pastel colours mixed with the boldness of Elegant Eggplant. The ink hadn't even dried yet when this card sold!! I quite often make cards for order and sell them also at various Craft Fairs. I am also happy to take orders if you have something special in mind, or if you see a post on my blog you just have to have!! I am currently designing wedding invitations for a friend. This is a great way for you to save money on your BIG day. All enquiries are very welcome!! Ok, here is the card I promised to show you that I made for my husband for Valentines Day. It is not a traditional Valentines day card, because my husband really isn't a hearts kind of guy. I wanted to use "manly" colours, but the sentiment says everything I want it to. I have only used 1 stamp for this card. 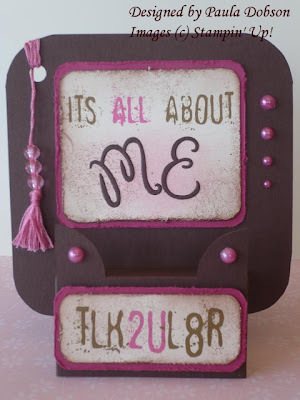 The sentiment comes from a set called A Beautiful Thing ($34.95). My husband is always impressed with the sponging that I just love to do, so I thought it would be all that more special to do a card using this technique for him. If you would like to learn this technique, then check out my classes in the side bar. If you can't make it to my class, I am happy to bring that class to you!! So long as you live in the Wellington area, of course. Just contact me and I can tell you more!